Star Trek U.S.S. Enterprise Alarm Clock - Moar Stuff - You don't need it but you know you want it. Wake up and boldly go! Alarm clock projects the time onto the wall or ceiling. Looks like the U.S.S. 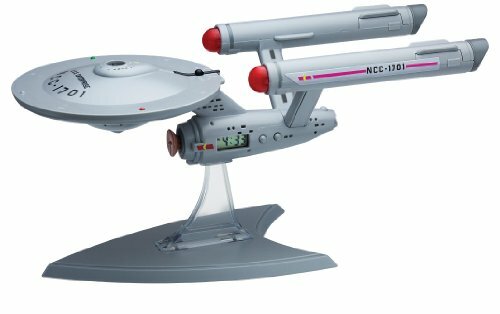 Enterprise NCC-1701 starship! Just right for any fan of Star Trek. Did you know that the starship U.S.S. Enterprise NCC-1701 can help you wake up at the right time? It's true! 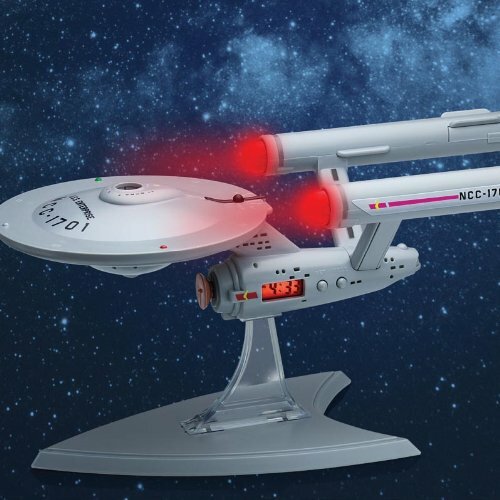 This Star Trek Enterprise NCC-1701 Ship Projection Alarm Clock is just right for any fan of the original series of Star Trek, and beyond. Made to look like the U.S.S. 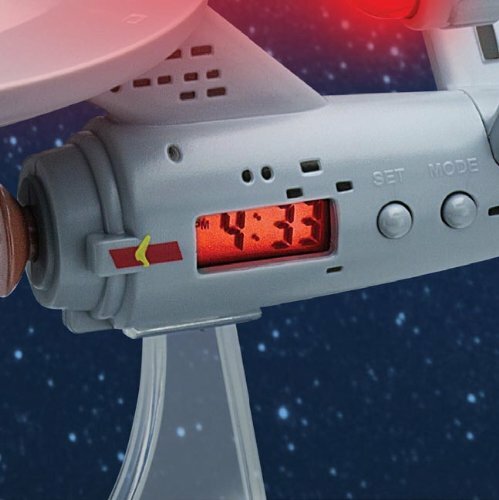 Enterprise NCC-1701 spaceship, this awesome alarm clock projects the time onto the wall or ceiling with an LED display! Requires 4x 'LR44' batteries, included. Measures about 9-inches long x 4-inches wide. The Star Trek U.S.S. Enterprise Alarm Clock is modeled after the original Enterprise (no bloody A, B, C, or D) and is the most logical way to make sure you get up for your duty shift. If you don’t start your duty watch on time, your commanding officer and whomever you’re relieving are going to be miffed. This is especially true if you’ve accidentally beamed over to the mirror universe. I’ve heard that the agonizers can really sting. 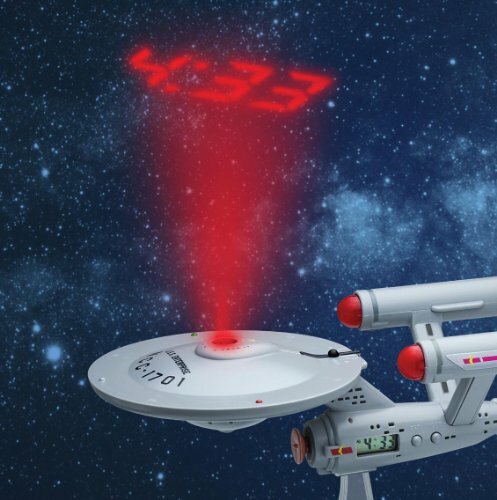 Instead of phasers, it projects the time on your wall or ceiling in big red numbers and it can play different sounds from the show such as the red alert klaxon or the firing of photon torpedoes for the alarm. When the alarm goes off, the Bussard collectors on the nacelles light up as well. When you receive this clock, it’s highly recommend that you synchronize it by contacting a Federation time beacon before you use it. Dimensions: 9″ long x 4″ wide. Batteries: 4 LR44 button cell batteries (included). Officially-licensed Star Trek: The Original Series product. It offers a backlit LCD display and it projects the time on your wall or ceiling. Nacelles light up when alarm goes off. Features sounds from the show: Red alert, photon torpedos, and Kirk calling from the bridge.